There are several species of grindelia, which grow primarily from the Mississippi River, westward. Thus far, I've been able to meet two of them, Grindelia squarrosa and G. aphanactis. Grindelia generally grows at elevations of 3,000 to 8,000 feet. I did find a vibrant stand at Emory Pass in the Gila National Forest, which stands at just over 8,200 feet. It prefers alkaline soils, and is often found in gravel on roadsides. The Latin name Grindelia comes from the name of a German botanist, David H. Grindel, whom it was named after. Its common name, gumweed, refers to the sticky resin which coats all green parts of the plant, but is concentrated in the flower buds. These buds have been chewed as a gum. The resin is very sticky, and sticks to the teeth. Below is a timeline of what the flowers of Grindelia squarrosa look like from bud to blossom. Like many resin-rich plants, Grindelia is an expectorant. It is useful for bronchial congestion, particularly with dry and stuck phlegm. Its anti-bacterial properties make it useful for respiratory infections and it soothes spasms and inflammation in the respiratory tract. It can be useful for spasmodic coughs, bronchitis, allergies and asthma. Being a warming expectorant, it is ideal for phlegm that lingers after the acute state of a respiratory infection. It also seems to be of value in sleep apnea. When I go on hikes on high-altitude hikes, I like to have some osha tincture with me, because it helps the respiratory system acclimate to the altitude so well. Recently, I went up into the mountains, but neglected to bring the osha. Luckily, there was grindelia growing everywhere. Chewing on a flower head, I immediately felt my bronchi and lungs open up. It wasn't as pronounced as the effects of osha, but it is helpful in a pinch. Grindelia is a mildly bitter herb. When we taste a bitter herb this activates the bitter taste receptors on the tongue, and the central nervous system communicates this information to various areas in the body, causing a cascade of physiological changes. The most immediately noticeable are the effects on the digestive system. The mouth secretes more saliva, which contains enzymes (like salivary amylase) that begin to break down foods. The stomach, duodenum, pancreas and liver secrete more digestive juices (which also contain enzymes). Peristalsis (the muscle movement that moves food through the digestive tract) is stimulated. Appetite also noticeably increases. Due to these actions, herbal bitters can be beneficial for those with sluggish digestion and poor appetite. Because they increase the overall health and function of the digestive system, they can also prove beneficial in health conditions that seem completely unconnected to the digestive system (though in bodily ecology, everything is ultimately connected to everything else). Herbal "bitters" are traditionally taken 15-20 minutes before meals. It is important that the bitterness is tasted, so a tea or tincture are the preferred forms to ingest it. I have to admit, before I began to really learn about grindelia I didn't think of it as a bitter. Because it is mildly bitter, I don't think its action on the digestive system would be as pronounced as, say, gentian. It will make an interesting organoleptic comparative study. I will write more about bitters and their actions in a future post. Herbalist Michael Moore said that Grindelia is on par with Calendula as a healing agent for the skin. It stems the growth of unwanted microbes, brings down inflammation, and stimulates regeneration of epithelial tissue. It is also an effective remedy for poison oak. Topically, I frequently use calendula in my formulas, so I'm looking forward to playing with grindelia in a salve or an oil. "Grindelia squarrosa has been highly eulogized as an efficient remedy in intermittent fever, and in other malarial affections, also to remove splenic enlargement which so frequently follows those disorders...Webster, however, asserts that the remedy has a special action upon the splenic circulation, and points out as the case for it one of splenic congestion associated with sluggish hepatic action and dyspepsia. Dull pain in the left hypochondrium, sallow skin, debility and indigestion are the symptoms pointing to its selection. The same author recommends it in chronic dyspepsia due to prolonged malarial influence, gastric pain when the spleen is seemingly involved, and in the splenic congestion of malarial cachexia. As a local application, the fluid extract is stated to be of value in the painful eczematous inflammation and vesicular eruption resulting from contact with the poison vine or the poison oak." "Grindelia robusta: Asthmatic breathing, with soreness and raw feeling in the chest; cough, harsh and dry; breathing labored, with a dusky coloration of the face in plethoric individuals. Locally, old atonic ulcers; full tissues; rhus poisoning. 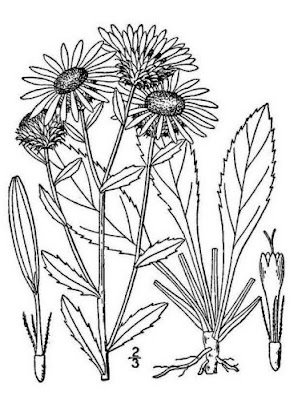 Grindelia squarrosa: Splenic congestion, especially when dependent on malarial cachexia; fullness and dull pain in left hypochondrium , with indigestion, pallid, sallow countenance, and general debility; gastric pains associated with splenic congestion." Michael Moore lists Grindelia arizonica as at-risk in New Mexico. Grindelia fraxinipratensis (Ash Meadows Gumweed) is listed as threatened in California and Nevada. Grindelia hallii (San Diego Gumplant) and Grindelia hirsutula var. maritima (San Francisco Gumplant) are threatened in California. I do not know if the last three species are medicinally interchangeable with the other Grindelia species listed above. Quite frankly, it doesn't matter. They need to be cared for and rehabilitated, so do this and avoid harvesting them in the wild. One of my fundamental beliefs about herbalism (and well-being in general), is that anyone who works with or uses plants inherently takes on a role of stewardship for these plants, and the ecosystems they inhabit. Just as herbalism is a manifestation of self-responsibility for our own well-being, we must also care for the well-being of our green friends. If we take without giving back, we perpetuate the unsustainable ideas that are a hallmark of the path that we've been on for far too long. Herbs are not man-made concoctions manufactured from dead substances in a laboratory. They are living medicine. Healthy and respected plants yield good medicine. Grindelia leaves and flowers are often prepared as a tea. It can also be made into a tincture, the flowering tips being the preferred part for this preparation. Topically, it can be prepared as a poultice, compress, salve, oil, and the tincture can be used as well. Recently I harvested some Grindelia squarrosa for the first time. I didn't pick a lot, as I'm a bit of an overly-cautious wild-crafter (this is okay). The leaves that I harvested were very sticky and resinous, so I decided to use both the leaves and flowers in my tincture. After a couple of weeks, I strained the tincture and gave it a taste. It was definitely warm and stimulating. It felt like a fire went down into my lungs and opened everything up. After a few minutes, my respiratory system and my entire body was in a state of relaxed well-being. I'm guessing this is due to its cardiac relaxant and mild sedative properties, or because of the actions that bitter herbs have on the nervous system (more on this in a future post). It turned out quite nicely. This blog is dedicated to all things herbal (with perhaps a few field trips to other ideas as well). I will be posting herbal monographs, photos, recipes, and related musings. I am Trish McCaul, an herbalist and botanical perfumer now living in the high desert of Southern New Mexico. I've always had a love and fascination for the wild plants and places of Earth. Some of my earliest and fondest memories include chewing on the sassafras my grandfather picked for me, and climbing conifers while getting my hands coated in aromatic sap. I delighted in opening the wonderful milky Asclepias syriaca (Milkweed) pods and spreading their fluffy seeds about, or sniffing violets and lilacs until I was dizzy. I love the sensory relationship to plants... the wonderfully complex array of tastes, aromas, textures and visual delights. This love of plants came full circle when I began to study herbalism 7 years ago. I immersed myself in this study, and it quickly became clear to me that herbalism was my calling. The bulk of my learning has come from rigorous self-study and experimentation. I have also studied with Deborah Brandt AHG and taken intensives and classes with Matthew Wood, Paul Bergner, Howie Brounstein and Margi Flint. I was fascinated with infusing aromatic & healing herbs into balms for topical use. I enjoyed making healthy organic products. And I'll that admit that part of my motivation grew from realizing that many body care companies define themselves as "natural", yet base a product formula on synthetic and often toxic ingredients, add a few token herbs, and present their products as holistic forms of nourishment. Weary of the green-washed marketplace, I started Mother McCaul's several years ago, with an offering of balms, salves and other body care products containing only organic and ethically wild-harvested ingredients with superior healing benefits. I trusted the herbs and the knowing that clean & simple ingredients would be effective. The response to these herbal products has been enormously affirming. Just over two years ago, and with the same commitment to clean, simple, genuine products, I started developing select perfumes and incense as Emma Purple Aromatics. I named the company after Emma Purple McCaul, my Cherokee and Irish great-great grandmother. For me, herbalism is rich in primeval mystery, like roots digging down into hidden Earth. And yet, it is completely accessible. It is simple medicine for common (and not so common) folk. So, as an introduction, I've shared parts of my journey as it's unfolding thus far. There's more to come, for myself and for all of us who share in this process. Welcome to Mother McCaul's Herbal.